The Award Winning War Party Re Unites for one show only ! Sat June 22-2013 . Aptn Television with Sky Bridges CEO Extended an invite to Bring War Party Back to The Big Stage ! So Rex , Cynthia , and Carmen Omeosoo are Feelin Reserved ! One More Time ! They will part of The Aboriginal Day Live at The Forks Winnipeg Festival, and also Broadcast Live ! 9PM Sharp (Central Time) War Party Hits the Stage ! Se All The Fans at The Forks or On TV ! 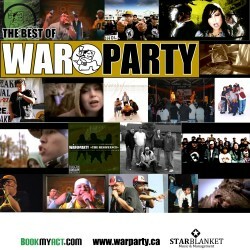 "The Best of War Party" Complilation CD of Your Favorite War Party Songs !